Being a psuedo-security guy of sorts, I'd decided to jump back into insecurity land a couple of weeks back. I haven't really been into security-tech for quite a long time, having hung up my script kiddie slingshot a long time back. But of late, it has again started to look attractive - but more than mere implementation issues, I've been looking for true blue design issues. Recently on IRC, dumbhead was defending his default password on his router, which is conveniently firewalled off from the WAN. In my attempts to prove that setup insecure, I discovered DNS Pinning. It has been truly enlightening to perform a cursory attack on a home router with a faked up nameserver (re-used my twisted.names code). The first request immediately does an iframe with a made-up hostname to ensure that no dns caches interfere. The resolution of that host (say "mordor") looks somewhat like this. Now there is a good probability that the first IP will be hit nearly immediately by the browser. The server is running a script which tails the access log as soon as that vhost is hit (for dynamic vhosts, install lighttpd-mod-mysql-vhost), marking the vhost in the table as "hit". A sudo'd python script hooks into the mysql table, flips that flag to "block" after running an iptables packet drop on dst port 80, src ip of the victim. Thirty seconds after loading the first iframe, the code in there creates another iframe with src=document.location+"?xyz". Very soon, that frame loads up 192.168.1.1 in the same domain as the attacking website. I've got a default exploit sequence, which opens up port 22 for the Huawei WA1003A router which BSNL is distributing these days - but this requires the default password to be unchanged. But the default password might not be required with the more expensive routers. If I could run my first evil iframe on port 2869 to commit the b0rkage, I would essentially be able to access the UPnP which takes a bit of SOAP to reduce the NAT into swiss cheese. But I'm a bit too lazy to actually write out those SOAP calls using XmlHttp (hah, same domain). And all that *without* a single password. The Domain Name Server (DNS) is the Achilles heel of the Web. I don't usually boast about my hacking exploits, but this is one occasion when I can claim that I did the right thing by breaking the security of a linux server. Let me explain the scenario. Dotgnu.org was cracked by a bunch of script kiddies on November 1st. 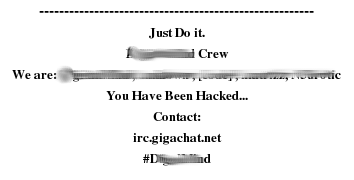 They defaced the website and left their message all over the website. These were a bunch of script kiddies who were using a canned script targetting phpnuke installation on the same box which was serving getdotgnu.com. We managed to track them down immediately, thanks to help of many dotgnu people (and others as well). Some people had very funny stuff to say about the incident like this blog. It got to the stage where the kids came to #dotgnu and sort of apologized. They all do when pushed to a wall and held there. For the last 10 days the server has just been hanging there without a proper admin to restore the code. Thankfully I had a login on that particular box which hosts the server, because it hosts this blog too. Also we had got a new domain called maybe.dotgnu.info for the google Summer of Code intern (krokas), which was running debian. The first domain was running hardened gentoo (from what I can read/guess). I had root on maybe.dotgnu.info, but not on the gentoo chroot which was hosting dotgnu.org and t3.dotgnu.info. So here's how you break out of a chroot if you already have root access and why FreeBSD jail() is a LOT safer than a chroot'ed server. The exploit is based on the fact that chroots are flat. There is no such thing as a nested chroot. So when you chroot from inside a chroot, you are doing the equivalent of a single chroot. The scary part is that the application which did a chroot can traverse out if it has root privileges - but which is not applicable for an application started inside a chroot. Voila, an easily exploitable hole. The ready to use break_chroot.c. Could it be any more simpler ? So next time you set up a server properly, make sure you set it up with something like User Mode Linux or Xen, rather than just relying on a chroot for security. And to think I spent 4 hours writing shell code for the do_brk() attack vector. Sometimes simple solutions work out very nicely indeed. Anyway the important part is that, dotgnu.org is back and running. I felt that old rush of illicit pleasure coming back - after all, God, root, what is difference ?.